Lisoka is the creation of Swedish menswear designer Lisa Våglund. Having graduated with a Master’s degree from the prestigious Danish Design School in Copenhagen, she went on to start her own fashion line of clothes with an eco-consciousness. 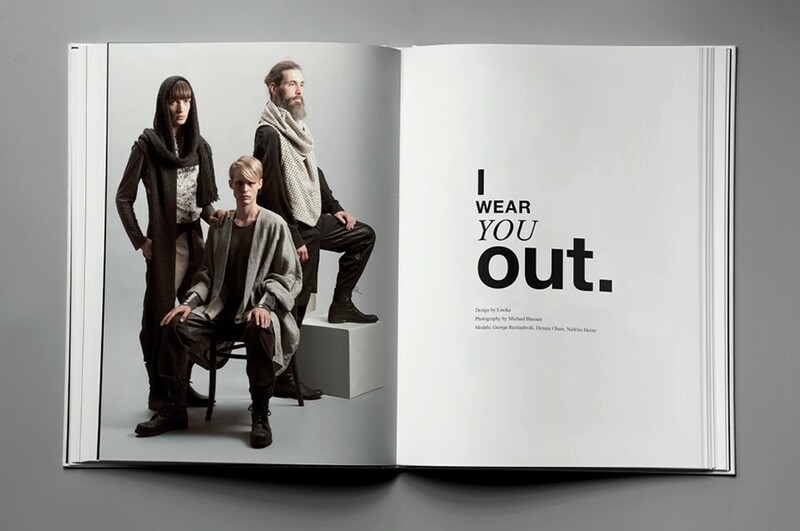 ‘I Wear You Out’ is her first full collection, shown recently at the Danish Design School MA Show and at the Designer’s Nest in Copenhagen. Dazed Digital: What initially attracted you to fashion design? Lisa Våglund: I like that you use the word attraction because that’s what it is and always has been to me; attraction and also fascination. It initially started out with me dressing my brother in different outfits when we were in daycare, I was about three and he was a few months old. DD: As a female designer what was it that drew you to design menswear? Lisa Våglund: I started out doing womenswear but I figured that my way of creating silhouettes fits menswear much better. It’s been a more honest process for me when it comes to material choice, colours shades and how I’ve shaped my silhouettes. I think I have a different perspective as a woman designing for men, I’m not stuck in all the rules and restrictions, I’m not designing for myself. Some of my designs are pretty unisex and could easily translate into womenswear as well. DD: What influences did you bring from Sweden to your studies in Denmark and how does your surrounding environment affect your work? Lisa Våglund: Swedish design is more minimalist and the colours are within a grey scale whereas Danish womenswear is a bit more feminine with pastel colours. It’s a thin line that I think only the Swedes and Danes actually care about. I’m fine with the definition of Scandinavian design if we think about in from a global perspective; it’s often clean, simple and precise and I’m inspired by that and I think it shows in my work. I got a new perspective on design when I lived in New York from 2009-2010. Design is more interesting when it’s a mix of other styles and street cultures. I’m a big fan of Scandinavian fashion brands like ACNE but it would look pretty boring if everyone wore it. That’s what freaks me out about Stockholm sometimes, everyone looks too good and the same so it gets boring. I prefer living in Copenhagen, it’s more hippie than hipster. DD: How important is the eco and organic aspect to your design? Lisa Våglund: I think it’s important, it’s ignorant not to consider it at all. I use ecological fabrics in my collections such as organic jersey. My main focus has been what the title refers to; clothes that are worn out and not just throw away because of fast moving trends. I wish people in general would be more aware of their consumption and have a ‘less is better’ kind of attitude. The collection is season-less which gives the wearer an individual choice to combine with their own style. DD: What sparks off an idea and inspires you. How do you approach design and what is what is your process? Lisa Våglund: It usually starts off with an abstract idea from whatever crosses my way such as listening to a song, reading an article or watching a play. I’ve started to figure myself out and sense when I get a strong feeling about an impression, sentence or sound. I leave it for a while before I star working on it. It’s not always a positive feeling, it’s just something that I can’t let go. A few years ago I collected some leftover tents at the Roskilde Festival that ended up being stage clothes for the singer Kissey Asplund. Last October. I found a book by Leah Gordon. I was immediately fascinated by her portraits but I didn’t know how to apply that to my work. I didn’t look at the book until I started working on my current collection in February. Along the way I dragged in two other artists named Erwin Wurm and Henrik Saxgren. I Wear You Out’ is the title of the collection and is the result of a fusion between these three artists. Lisa Våglund: I’m showing my collection twice this week on Thursday at the Danish Design School MA Show as well as the Designer’s Nest competition on Friday which will show the work from all the major Scandinavian schools. I’m also going to look for a further possible collaboration with the handcraft cooperative Chola in Bolivia with whom I’d like to realize a small production to then sell in Europe. DD: Any future plans for Lisoka? Lisa Våglund: I’m hoping to do more collaborations with other creators and have a good friend who makes documentaries and we’ve talked about doing something together. I’d like to work for menswear designer brand and will try to look for work mainly at CPH Vision but I’m open to moving abroad too. A dream would be to work for a brand like Raf Simons or Kris Van Assche.